It has been seven years since fellow Sudbury resident Susan Brown and I co-founded SMILE Mass out of my home on Dudley Road with the mission of helping handicap children and their families create happy, healthy memories. In that short time, we have had enormous success. Here is a brief recap of what we have achieved over the past few years and where we are headed in the near future. SMILE Mass was born out of a simple goal – to get a handicap accessible swing installed in a playground in Sudbury so that my son, Nicholas, would be able to enjoy the park alongside his younger sister and friends. That simple goal resonated with the people in our town and evolved into a major project to construct a playground that children of all abilities could enjoy. 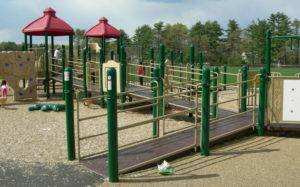 Together, we were able to design, fund and build the first fully accessible playground in MetroWest in less than a year. The SMILE playground adjacent to Haskell Field is now a landmark in our community, a destination for families throughout MetroWest and greater Boston, and a model for towns across the Commonwealth and beyond. Building on the success of the SMILE playground project, in 2010, SMILE Mass turned its focus towards the beaches of Cape Cod. 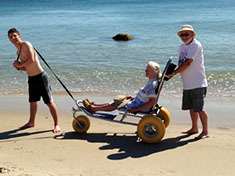 Our goal was to donate a floating beach wheelchair to every public beach on Cape Cod that requested one. If you have not witnessed one of these amazing chairs in action, Click here and see firsthand how a chair can touch the life of a family simply by providing access to a day at the beach. Over the past 7 years, we have donated over 120 floating beach wheelchairs to public beaches in Massachusetts, Maine and New Hampshire as well as established a loaner program currently based in Sudbury through which anyone can borrow specially designed equipment (beach wheelchairs, adapted bicycles, snow sleds, jog strollers etc.) to use for a day or a week, at home or on vacation. Emboldened by our achievements, we now turn to what is our biggest undertaking to date – the construction of a state-of-the-art, fully accessible, rental vacation home on Cape Cod! Finding the right facilities that are actually fully handicapped accessible with all the right amenities can be extremely difficult for people with mobility or other severe disabilities. If found, these facilities often come with many extra fees that make it difficult for many families to afford. The SMILE Mass vacation home will be designed to accommodate people with a wide range of disabilities, with financial assistance provided to those who qualify. I hope you will consider continuing to support SMILE Mass with a tax-deductible gift. A donation of any denomination will make a tangible difference – whether it means purchasing new equipment for our loaner program or funding the construction of a room in the Cape house. Please do not hesitate to contact me directly if you are interested in learning more about our organization, our projects or ways to contribute.